Lovely dried floral findings create a gentle, fluttering, ever-changing view in our delicate liquid kaleidoscope. 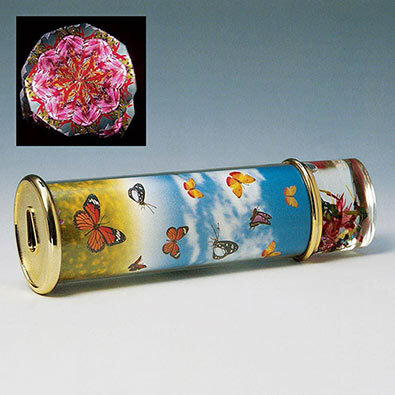 The colourful scenic cylinder captures the essence of delicate butterfly varieties floating through a meadow. Solid acrylic casing with brass tone eyepiece and fittings make this a truly unique gift. The colourful images seem to explode right before your eyes. Measures 19cm x 5cm. Gaze into an ever changing world of shape and color within this fascinating kaleidoscope. Features two lenses for a unique viewing experience on either end and a clear center displaying the jeweled findings. Includes an elegant black stand measuring 8cm x 3cm. Measures 23cm long.